Wheelchair users may sometimes forget to put on the breaks before standing up, causing the wheelchair to roll away. The purpose of this project was to create an automatic locking system for wheelchairs to prevent this and the risk of injury or falls. Wheelchair users may sometimes forget to put on the breaks before standing up. As a result, the wheelchair may roll away and the person could fall or get injured. The purpose of this project was to create an automatic locking system for wheelchairs that is easy to install and relatively inexpensive. The goal was to have the wheelchair lock when the user is about to stand up and unlock when the user sits down again. The newly designed system is composed of a pressure mat and a locking mechanism. The pressure mat fits underneath the cushion on the wheelchair seat. When a user stands up, this information is communicated to the locking mechanism that locks the wheelchair in place. When a user sits down, the system unlocks the wheelchair. This solution was tested with a small group of older adults. •	To engage the locking mechanism earlier. •	To modify the system to completely minimize any backwards movement of the wheelchair when standing up. •	To improve the electronic parts for a more reliable solution. After more testing, the system could be produced for different types of wheelchairs. In practice, the system could easily be installed on wheelchairs, but would need to be recharged every night. 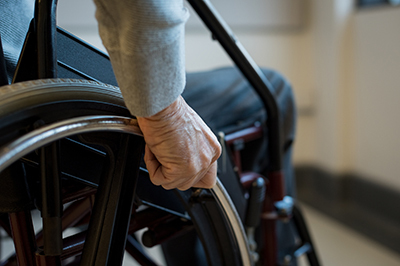 The system would help ensure older adults or anyone using a wheelchair are safe when they try to stand up, regardless of whether or not their wheelchair brakes are on.